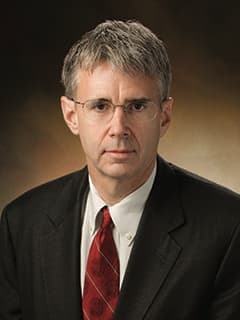 J. William Gaynor, MD, is an attending surgeon in the Cardiac Center and Surgical Director of the Heart Failure and Transplant Program at Children's Hospital of Philadelphia. He holds the Daniel M. Tabas Endowed Chair in Pediatric Cardiothoracic Surgery. Dr. Gaynor specializes in reconstructive heart surgery in infants. Dr. Gaynor is an attending Cardiothoracic Surgeon at Children's Hospital of Philadelphia and Associate Professor of Surgery at the University of Pennsylvania School of Medicine. He received his medical degree at the Medical University of South Carolina, then completed general and cardiothoracic surgery residencies at Parkland Memorial Hospital and Duke University Medical Center. He completed the congenital cardiac surgery fellowship at the Hospital for Sick Children, Great Ormond Street in London. He received his appointment at The Children's Hospital of Philadelphia in 1995. Dr. Gaynor performs the full range of reconstructive congenital operations, as well as cardiothoracic transplantation. Dr. Gaynor is also organizing the Division of Cardiothoracic Surgery's implantable ventricular assist device (VAD) program. He specializes in the analyses of clinical case series, utilizing the large case rate at Children's Hospital to understand the nature and variety of congenital cardiac and thoracic lesions and determine the effectiveness of surgical intervention. In the laboratory, Drs. Gaynor and Spray are investigating the early stages of pulmonary vascular obstructive disease, a complication of many congenital cardiac anomalies. Dr. Gaynor is also an authority on the measurement of intrinsic left ventricular contractility. Liu MY, Zielonka B, Snarr BS, Zhang X, Gaynor JW, Rychik J. Longitudinal Assessment of Outcome From Prenatal Diagnosis Through Fontan Operation for Over 500 Fetuses With Single Ventricle‐Type Congenital Heart Disease: The Philadelphia Fetus‐to‐Fontan Cohort Study. J Am Heart Assoc. 2018 Sept. 29;7(19):e009145. Atchley KD, Pappas J, Kennedy A, Coffin SE, Gerber JS, Fuller SF, Spray TL, McCardle K, and Gaynor JW. Use of administrative data for surgical site infection surveillance after congenital cardiac surgery results in inaccurate reporting of site infection rates. Ann Thorac Surg 2014;97:651-8. Parnell AS, Shults J, Gaynor JW, Leonard MB, Dai D, and Feudtner C. Accuracy of all patient refined diagnosis related groups classification system in congenital heart surgery. Ann Thorac Surg 2014; 97:641-50. Kirsch RE, Glatz AC, Gaynor JW, Nicolson SC, Spray TL, Wernovsky G, Bird GL. Results of elective repair at 6 months or younger in 277 patients with Tetralogy of Fallot: a 14-year experience at a single center. J Thorac Cardiovasc Surg 2014; 147:713-7. Gaynor JW, Ittenbach RF, Gerdes M, Bernbaum J, Clancy RR, McDonald-McGinn DM, Zackai EH, Wernovsky G, Nicolson SC, and Spray. Neurodevelopmental outcomes in preschool survivors of the Fontan procedure. J Thorac Cardiovasc Surg 2014; 147:1276-83. Goff DA, Shera DM, Tang S, Lavin NA, Durning SM, Nicolson SC, Montenegro LM, Rome JJ, Gaynor JW, Spray TL, Vossough A, and Licht D. Risk factors for preoperative periventricular leukomalacia in term neonates with hypoplastic left heart syndrome are patient related. J Thorac Cardiovasc Surg 2014; 147: 1312-8. Rossano JW, Goldberg DJ, Fuller S, Ravishankar C, Montenegro LM, and Gaynor JW. Successful use of total artificial heart in the failing Fontan circulation. Ann Thorac Surg 2014; 97: 1438-40. Keeshan BC, Goldfarb SB, Lin KY, Kreindler JL, Kaufman BD, Gaynor JW, Shaddy RE, and Rossano JW. Impact of congenital heart disease on outcomes of pediatric heart-lung transplantation. Pediatr Transplantation 2014; 18: 204-210. Murphy MO, Glatz AC, Goldberg DJ, Rogers LS, Ravishankar C, Nicolson SC, Steven JM, Fuller S, Spray TL, and Gaynor JW. Management of early Fontan failure: a single-institution experience. European Journal of Cardio-Thoracic Surgery 2014; 1-7. Pasquali SK, Peterson ED, Jacobs JP, He X, Li JS, Jacobs ML, Gaynor JW, Hirsch JC, Shah SS, and Mayer JE. Differential case ascertainment in clinical registry vs. administrative data and impact on outcomes assessment in pediatric heart surgery. Ann Thorac Surg 2013; 95:197-203. Jacobs JP, Jacobs ML,Maruszewski B, Lacour-Gayet FG, Tchervenkov CI, Tobota Z, Stellin G, Kurasawa H, Murakami A, Gaynor JW, Pasquali SK, Clarke DR, Austin EH, and Mavroudis C. Initial application in the EACTS and STS congenital heart surgery databases of an empirically derived methodology of complexity adjustment to evaluate surgical case mix and results. Eur Jo Cardiothorac Surg 2012; 42: 775-779. Gaynor JW, Jarvik GP, Gerdes M, Kim DS, Rajagopalan R, Bernbaum J, Wernovsky G, Nicolson SC, Spray TL, and Clancy RR. Postoperative electroencephalographic seizures are associated with deficits in executive function and social behaviors at 4 years of age following cardiac surgery in infancy. J Thorac Cardiovasc Surg 2013; 146; 132-139. Di Maria MV, Glatz AC, Ravishankar C, Quartermain M, Rush CH, Nance M, Gaynor JW, and Goldberg DJ. Supplemental tube feeding does not mitigate weight loss in infants with shunt-dependent single ventricle physiology. Ped Cardiol 2013;34: 350-1356. Pasquali SK, Gaies MG, Jacobs JP, Gaynor JW, and Jacobs ML. Centre variation in cost and outcomes for CHD. Cardiol Young 2013; 22:796-799. Buckley EM, Lynch JM, Goff DA, Schwab PJ, Baker WB, Durduran T, Busch DR, Nicolson SC, Montenegro LM, Naim MY, Xiao R, Spray TL, Yodh AG, Gaynor JW, and Licht DJ. Early postoperative changes in cerebral oxygen metabolism following neonatal cardiac surgery: effects of surgical duration. J Thorac Cardiovasc Surg 2013; 145: 196. Ravishankar C,Zak V, Williams IA, Bellinger DC, Gaynor JW, Ghanayem NS, Krawczeski CD, Licht DJ, Mahony L, Newburger JW, Pemberton VL, Williams RV, Sananes R, Cook AL, Atz T, Khaikin S, and Hsu DT. Association of impaired linear growth and worse neurodevelopmental outcome in infants with single ventricle physiology: a report from the Pediatric Heart Network Infant Single Ventricle Trial. Pediatrics 2013; 162: 250. Piper BJ, Yasen AL, Tayler AE, Ruiz JR, Gaynor JW, Dayger CA, Gonzalez-Gross M, Kwon OD, Nilsson LG, Day INM, Raber J, and Miller K. Non-replication of an association of apolipoprotein E2 with sinistrality. Laterality 2013; 18: 251-261. Mahle, WT, Lu MM, Ohye RG, Gaynor JW, Goldberg CS, Sleeper LA, Pemberton VL, Massatto KA, Williams IA, Sood E, Krawczeski CD, Lewis A, Mirarchi N, Scheurer M, Pasquali SK, Pinto N, Jacobs JP, McCrindle BW, and Newburger JW. A predictive model for neurodevelopmental outcome after the Norwood procedure. Ped Cardiol 2013; 34:327-333. Buckley EM, Naim MY, Lynch JM, Goff DA, Schwab PJ, Diaz LK, Nicolson SC, Montenegro LM, Lavin NA, Durduran T, Spray TL, Gaynor JW, Putt ME, Yodh AG, Fogel MA, and Licht D. Sodium Bicarbonate causes dose dependent increases in cerebral blood flow in infants and children with single ventricle physiology. Pediatric Research 2013; 73: 668-673. Wellen SL, Glatz AC, Gaynor JW, Montenegro LM, and Cohen MS. Transesophageal echocardiography probe insertion failure in infants undergoing cardiac surgery. Congenital Heart Disease 2013; 8: 240-245. Rossano JW, Woods RK, Berger S, Gaynor JW, Ghanayem N, Morales DLS, Ravishankar C, Mitchell ME, Shah TK, Mahr C, Tweddell JS, Adachi I, Zangwill S, Wearden PD, Icenogle TB, Jaquiss RD, and Rychik J. Mechanical support as failure intervention in patients with cavopulmonary shunts (MFICS): rationale and aims of a new registry of mechanical circulatory support in single ventricle patients. Congenital Heart Disease 2013; 8: 182-186. Lefkowitz DS, Novosel RS, Mohamed Z, Scharko A, Lin KY, Shaddy RE, Paridon SM, Miller K, Kaufman BD, Gaynor JW, and Rossano J. Psychiatric diagnoses and the use of psychiatric medications in pediatric ventricular assist device recipients Pediatric Transplantation 2013; 85: 62. Pasquali SK, He X, Jacobs ML, Hall M, Gaynor JW, Shah SS, Peterson ED, Hill KD, Li JS, and Jacobs and JP. Hospital Variation in postoperative infection and outcome after congenital heart surgery. Ann Thorac Surg 2013; 96: 657-63. Yi JJ, Tang SX, McDonald DM, Calkins ME, Whinna DA, Souders MC, Zackai EL, Goldmuntz E, Gaynor JW, Gur RC, Emanuel BS, Gur RE Contribution of congenital heart disease in neuropsychiatric outcome in school-age children with 22q11.2 deletion syndrome. Am J Med Genet Part B 2013; 9999: 1-11. Eckhauser AW, O’Byrne ML, Weinberg PM, Ravishankar C, Spray TL, and Gaynor JW. Hypoplastic left ventricle and scimitar syndrome. Ann Thorac Surg 2013; 96:2232-4. Pasquali SK, Li JS, He X, Jacobs ML, O’Brien SM, Hall M, Jaquiss RD, Welke KF, Peterson ED, Shah SS, Gaynor JW, Jacobs JP. Perioperative methylprednisolone and outcome in neonates undergoing heart surgery. Pediatrics 2012; 129: e385-391. Pasquali SK, Li JS, Burstein DS, Sheng S, O’Brien, Jacobs ML, Jaquiss RD, Peterson ED, Gaynor JW, Jacobs JP. Association of center volume with mortality and complications in pediatric heart surgery. Pediatrics 2012; 129: e370-376. Goff DA, Luan X, Gerdes M, Bernbaum J, D’Agostino J, Rychik J, Wernovsky G, Licht D, Nicolson SC, Clancy RR, Spray TL, and Gaynor JW. Younger gestational age is associated with worse neurodevelopmental outcomes after cardiac surgery in infancy. J Thorac Cardiovasc Surg 2012; 143: 535-542. Elia J, Glessner JT, Wang K, Takahashi N, Hadley D, Sleiman PM, Zhang H, Kim CE, Robison R, Lyon G, Gaynor JW, et al. Genome-wide copy number variation study associates metabotropic glutamate receptor gene networks with attention deficit hyperactivity disorder. Nature Genetics 2012; 44: 78-84. Newburger JW, Sleeper LA, Bellinger D, Goldberg CS, Tabbutt S, Lu M, Mussatto KA, Williams IA, Gustafson KE, Mital S, Pike N, Sood E, Mahle W, Cooper DS, Dunbar-Masterson C, Dent Krawczeski C, Lewis A, Menon SC, Pemberton VL, Ravishankar C, Atz TW, Ohye R, and Gaynor JW. Early developmental outcome in children with hypoplastic left heart syndrome and related anomalies: the single ventricle trial. Circulation 2012; 125: 2081-2091. Pasquali SK, He X, Jacobs JP, Jacobs ML, O’Brien SM, and Gaynor JW. Evaluation of failure to rescue as a quality metric in pediatric heart surgery: an analysis of the STS congenital heart surgery database. Ann Thorac Surg 2012; 94: 573-580. Hirsch JC, Jacobs M, Andropoulos D, Austin E, Jacobs JP, Licht D, Pigula F, Tweddell J, and Gaynor JW. Protecting the infant brain during cardiac surgery: a systematic review for the Society of Thoracic Surgeons’ evidence based task force and congenital heart surgery workforce. Ann Thorac Surg 2012; 94:1365-1373. Rogers LS, Glatz A, Ravishankar C, Spray TL, Nicolson SC, Rush CH, Gaynor JW, and Goldberg DJ. 18 years of the Fontan operation at a single institution: results from 771 consecutive patients. J Am Coll Cardiol 2012: 60: 1018-1025. Pasquali S, Ohye RG, Kaltman J, Calderone CA, Dunbar-Masterson C, Gaynor JW, Jacobs JP, Kaza AK, Newburger J, Rhodes JF, Scheurer M, Silver E, Sleeper LA, Tabbutt S, Tweddell J, Uzark K, Wells W, Mahle WT, Pearson GD and Pediatric Network Investigators. Variation in perioperative care for infants undergoing the Norwood procedure J Thorac Cardiovasc Surg 2012; 144: 915-921. Padalino MA, Vida VKL, Boccuzzo G, Tonello M, Sarris GE, Berggren H, Comas JV, Di Donato RM, Ebels T, Hraska V, Jacobs J, Gaynor JW, Metras D, Pretre R, Pozzi M, Rubay J, Sairaen H, Schreiber C, Maruszewsky B, Basso C, and Stellin G. Surgery for primary cardiac tumors in children: early and late results in a multi-center European congenital heart surgeons association (ECHSA) study. Circulation 2012; 126: 22-30. Wu G, Jaimes C, Gaynor JW, and Markowitz RI. Radiographic signs of open median sternotomy in neonates and infants. Pediatr Radiol 2012; 42: 674-678. Patel AK, Farrell P, Harris M, Gaynor JW, and Gillespie MJ. Acquired ventricular septal aneurysm in a patient with pulmonary atresia with intact ventricular septum. Cardiol Young 2012; 22: 227-229. Kim DS, Stenaway IB, Rajagopalan R, Bernbaum JC, Solot CB, Burnham N, Zackai EH, Clancy RR, Nicolson SC, Gerdes M, Nickerson D, Hakonarson H, and Gaynor JW. Results of genome-wide analyses on neurodevelopmental phenotypes at four-year follow-up following cardiac surgery in infancy. PLoS ONE 2012: 7: e45936. Kaczorowski DJ, Sathanandam S, Ravishankar C, Gillespie MJ, Montenegro LM, Gruber PJ, Spray TL, Gaynor JW, and Lin KL. Coronary osteoplasty for congenital atresia of the left main coronary artery ostium. Ann Thorac Surg 2012; 94: 1307-10. D’Alessandro LCA, Paridon S, and Gaynor JW. Successful repair of aortic valve perforation in pediatric Libman Sacks endocarditis. J Thorac Cardiovasc Surg 2012; 144: 151-153. Szwast Al, Marino BS, Rychik J, Gaynor JW, Spray TL, and Cohen MS. Usefulness of left ventricular inflow index to predict successful biventricular repair in right-dominant unbalanced atrioventricular canal. Am J Cardiol 2011; 107: 103-109. Clancy RR, Dicker L, Cho S, Cook N, Nicolson SC, Wernovsky G, Spray TL, and Gaynor JW. Agreement between long-term neonatal background classification by conventional and amplitude-integrated EEG. J Clin Neurophysiology 2011; 28: 1-9. O’Connor MJ, Ravishankar C, Ballweg JA, Gillespie MJ, Gaynor JW, Tabbutt S, Dominguez TE. Early systemic-to-pulmonary artery shunt intervention in neonates with congenital heart disease. J Thorac Cardiovasc Surg 2011; 142: 106-112. Zelicourt DA, Haggerty CM, Sundareswaran KS, White BS, Rosina JR, Kanter KR, Gaynor JW, Spray TL, Stavropoulos F, Fogel MA, and Yoganathan’s AP. Individualized computer-based surgical planning to address pulmonary arteriovenous malformations in patients with a single ventricle with an interrupted inferior cava and azygous continuation. J Thorac Cardiovasc Surg 2011; 141:1170-7. Rogers LS, Peterson AL, Gaynor JW, Rome JJ, Weinberg PM, and Rychik J. Mitral valve dysplasia syndrome: a unique form of left-sided heart disease. J Thorac Cardiovasc Surg 2011; 142: 1381-7. Goldfarb SB, Gaynor JW, Fuller S, Kreindler J, Montenegro LM, Fynn-Thompson F, Visner G. Induction therapy with antithymocyte globulin before reperfusion. Ann Thorac Surg. 2010 Oct;90(4):1110-4; discussion 1114-5. Read abstract. Gaynor JW, Gerdes M, Nord AS, Bernbaum J, Zackai E, Wernovsky G, Clancy RR, Heagerty PJ, Solot CB, McDonald-McGinn D, Jarvik GP. Is cardiac diagnosis a predictor of neurodevelopmental outcome after cardiac surgery in infancy? J Thorac Cardiovasc Surg. 2010 Oct 14. [Epub ahead of print] Read abstract. Ballweg JA, Dominguez TE, Tabbutt S, Rome JJ, Gaynor JW, Nicolson SC, Spray TL, Ravishankar C. Reintervention for arch obstruction after stage 1 reconstruction does not adversely affect survival or outcome at Fontan completion. J Thorac Cardiovasc Surg. 2010 Sep;140(3):545-9. Read abstract. Quartermain MD, Ittenbach RF, Flynn TB, Gaynor JW, Zhang X, Licht DJ, Ichord RN, Nance ML, Wernovsky G. Neuropsychological status in children after repair of acyanotic congenital heart disease. Pediatrics. 2010 Aug;126(2):e351-9. Epub 2010 Jul 26. Read abstract. Burnham N, Ittenbach RF, Stallings VA, Gerdes M, Zackai E, Bernbaum J, Clancy RR, Gaynor JW. Genetic factors are important determinants of impaired growth after infant cardiac surgery. J Thorac Cardiovasc Surg. 2010 Jul;140(1):144-9. Epub 2010 Apr 9. Ades AM, Dominguez TE, Nicolson SC, Gaynor JW, Spray TL, Wernovsky G, Tabbutt S. Morbidity and mortality after surgery for congenital cardiac disease in the infant born with low weight. Cardiol Young.2010 Feb;20(1):8-17. Epub 2009 Dec 18. O'Connor MJ, Menteer J, Chrisant MR, Monos D, Lind C, Levine S, Gaynor JW, Hanna BD, Paridon SM, Ravishankar C, Kaufman BD. Ventricular assist device-associated anti-human leukocyte antigen antibody sensitization in pediatric patients bridged to heart transplantation. J Heart Lung Transplant. 2010 Jan;29(1):109-16. Brothers J, Gaynor JW, Paridon S, Lorber R, Jacobs M. Anomalous Aortic Origin of a Coronary Artery with an Interarterial Course: Understanding Current Management Strategies in Children and Young Adults. Pediatr Cardiol. 2009 Jun 2. Raffini L, Schwed A, Zheng XL, Tanzer M, Nicolson S, Gaynor JW, Jobes D. Thromboelastography of Patients After Fontan Compared with Healthy Children. Pediatr Cardiol. 2009 Apr 9. Licht DJ, Shera DM, Clancy RR, Wernovsky G, Montenegro LM, Nicolson SC, Zimmerman RA, Spray TL, Gaynor JW, Vossough A. Brain maturation is delayed in infants with complex congenital heart defects. J Thorac Cardiovasc Surg. 2009 Mar;137(3):529-36; discussion 536-7. Hehir DA, Dominguez TE, Ballweg JA, Ravishankar C, Marino BS, Bird GL, Nicolson SC, Spray TL, Gaynor JW, Tabbutt S. Risk factors for interstage death after stage 1 reconstruction of hypoplastic left heart syndrome and variants. J Thorac Cardiovasc Surg. 2008 Jul;136(1):94-9, 99.e1-3. Epub 2008 May 22. Kaltman JR, Gaynor JW, Rhodes LA, Buck K, Shah MJ, Vetter VL, Madan N, Tanel RE. Subcutaneous array with active can implantable cardioverter defibrillator configuration: a follow-up study. Congenit Heart Dis. 2007 Mar;2(2):125-9. Ballweg JA, Dominguez TE, Ravishankar C, Gaynor JW, Nicolson SC, Spray TL, Tabbutt S. A contemporary comparison of the effect of shunt type in hypoplastic left heart syndrome on the hemodynamics and outcome at Fontan completion. J Thorac Cardiovasc Surg. 2010 Sep;140(3):537-44. Read abstract. Lefkowitz DS, Novosel RS, Mohamad Z, Scharko A, Lin KY, Shaddy RE, Paridon SM, Miller K, Kaufman BD, Gaynor JW, and Rossano JW. Psychiatric diagnoses and the use of psychiatric medication in pediatric ventricular assist device recipients. Pediatric Transplantation 2013; 17: 62. Pasquali SK, He X, Jacobs M, Shah S, Peterson ED, Hall M, Gaynor JW, Hill KD, Welke KF, Mayer JE, Jacobs JP and Li JS. Hospital costs for pediatric heart surgery vary widely across institutions. J Amer Col Cardiol 2013; 61: 10. Salva JJ, Lin KY, Lefkowitz DS, Paridon SM, Gaynor JW, Hammond R, Shaddy RE, and Rossano JW. Impact of adolescence age on graft survival in patients with congenital heart disease versus myocarditis. J Heart Lung Transplant 2013; 32; S191. Morales DL, Gaynor JW, Rossano JW, Jefferies JL, Ryan TD, Towbin JA, and Lorts A. The worldwide use of Syncardia Total Artificial Heart in patients with congenital heart disease. J Heart Lung Transplant 2013; 32: S142. Lefkowitz DS, Novosel RS, Mohamad Z, Scharko A, Lin KY, Shaddy RE, Paridon SM, Miller K, Kaufman BD, Gaynor JW, and Rossano JW. Psychiatric diagnoses and the use of psychiatric medication in pediatric ventricular assist device recipients. J Heart Lung Transplant 2013; 32; S288. Goldfarb SB, Weinrib S, Kreindler J, Hammond R, Gaynor JW, and Rossano J. Adolescent CF lung transplant recipients have decreased survival when compared to CF lung transplant recipients in other age groups. J Heart Lung Transplant 2013; 32: S150. Yi JJ, Tang SX, Whinna DA, McDonald-McGinn DM, Bailey A, Souders MC, Meyers N, Burnham N, Gaynor JW, Goldmuntz E, Zackai EH, Emanuel B, and Gur RC. Congenital heart disease in 22Q11.2 deletion syndrome in school age children is not associated with increased psychopathology or neurocognitive impairment. Biological Psychiatry 2013; 73: 285S. Rossano JW, Lin KY, Paridon SM, Gaynor JW, Shaddy RE, Kaufman BD. Pediatric heart transplantation from donors with depressed ventricular function: an analysis of the united network of organ sharing database. J Heart and Lung Transplant 2012: 31: S16. Rossano J, Goldberg D, Mott AR, Ravishankar C, Gaynor JW, Falkensammer C, Paridon S, and Rychik J. Hospitalizations in single ventricle patients in the United States: prevalence and outcomes from 2000-2006. JACC 2012; 59: E745. Rossano JW, Lin K, Paridon S, Gaynor JW, Shaddy R, and Kaufman B. Pediatric heart transplantation from donors with depressed ventricular function: an analysis of the united network organ sharing database. JACC 2012; 59: E741. Newburger JW, Sleeper, LA, Bellinger DC, Goldberg CS, Tabbutt S, Lu MM, Mussatoo KA, Williams IA, Gustafson KE, Mital S, Pike N, Sood E, Mahle WT, Cooper DS, Dunbar-Masterson C, Krawczeski CD, Lewis A, Menon S, Pemberton PL, Ravishankar C, Atz, TW, Ohye RG, and Gaynor JW. Early neurodevelopmental outcome in hypoplastic left heart syndrome and related abnormalities: the Single Ventricle Reconstruction trial. Circulation 2011; 124:S Nov 22, 2011. Pasquali SK, Jacobs JP, He X, Jacobs ML, O’Brien SM, Hall MJ, Jaquiss RD, Welke KF, Peterson ED, Shah SS, Gaynor JW, and Li JS. Timing of perioperative methylprednisolone and outcome in infants undergoing heart surgery. Circulation 2011; 124: S Nov 22, 2011. Oyhe RG, Pearson GD, Lu, MM, Kaltman J, Calderone C, Derby C, Dunbar-Masterson C, Gaynor JW, Jacobs JP, Kaza AK, Pasquali SK, Rhodes JF, Scheurer M, Silver E, Sleeper LA, Tabbutt S, Tweddell JS, Uzark K, Wells W, and Newburger J. Variation in perioperative management of Norwood surgery in the pediatric heart network’s single ventricle reconstruction trial. JACC 2011; 57:E428. Ravishankar C, Zak V, Bellinger D, Cook A, Gaynor JW, Ghanayem N, Krawczeski C, Licht DJ, Mahony L, Newburger J, Pemberton V, Atz T, Khaikin S, Sananes R, Williams IA, Williams RV, and Hsu D. Linear growth failure is associated with worse neurodevelopmental outcome in infants with single ventricle physiology. JACC 2011; 57: E420. Rogers L, Glatz AC, Ravishankar C, Rush C, Nicolson S, Rychik, J, Spray TL, Gaynor JW, and Goldberg DJ. Eighteen years of the Fontan operation at a single institution: results from 771 consecutive patients. JACC 2011; 57:E402. Lyerly HK and Gaynor JW (eds). The Handbook of Surgical Intensive Care: Practices of the Surgical Residents at the Duke University Medical Center, 3rd Edition. Chicago: Mosby Year Book, 1992. Spanish Translation-Lyerly HK and Gaynor JW (eds). The Handbook of Surgical Intensive Care, 3rd Edition. Chicago: Mosby Year Book, 1992. German Translation-Lyerly HK, Gaynor JW, and Foitzik T (eds). The Handbook of Surgical Intensive Care, 3rd Edition. Heidelberg: Springer-Verlag GmbH & Co. KG, 1994. Brothers JA, Gaynor JW: Coronary Artery Anomalies in Children. In: Mastery of Cardiothoracic Surgery. Kaiser LR, Kron IL, Spray TL (eds). Lippincott Williams and Wilkins 2013. Ravishankar C, Dominquez TE, Rosenthal TM, and Gaynor JW. Mechanical Circulatory Support in the Patient with Congenital Heart Disease. In: Heart Failure in Congenital Heart Disease: From Fetus to Adult. Shaddy RE (Eds). 2011. 123-153. Berkowitz DH and Gaynor JW. Management of Pediatric Cardiopulmonary Bypass. In: Pediatric Cardiac Surgery, Fourth Edition. Mavroudis C, and Backer CL (eds) Wiley- Blackwell. Fuller S, and Gaynor JW. Aortopulmonary Window and Aortic Origin of a Pulmonary Window. In: Pediatric Cardiac Surgery, Fourth Edition. Mavroudis C, and Backer CL (eds) Wiley- Blackwell. Brothers JA and Gaynor JW. Surgery for Congenital Anomalies of the Coronary Arteries. John Hopkins Manual of Cardiothoracic Surgery, 2nd Edition. Yan S, Doty J, and Versula L (eds.) McGraw-Hill. Brothers JA, Gaynor JW. Surgery for Congenital Anomalies of the Coronary Arteries. In: Sabiston and Spencer Surgery of the Chest, 8th Edition. Selke, Del Nido, Swanson (eds). Elsevier 2010, 1963-1980. Wernovsky G and Gaynor JW. Long-term neurological outcomes in children with congenital heart disease. In: Avery’s Diseases of the Newborn, 8th Edition. Taeusch HW, Ballard RA, and Gleason CA (eds). Elsevier Saunders, 2005, 896 –901. Gaynor JW. Coarctation, Aortopulmonary Collaterals, and Aortopulmonary Shunts. In: Sabiston & Spencer Surgery of the Chest, 7th Edition. del Nido P, Swanson SJ (eds). Elsevier 2005, 1913-1931. Gaynor JW. Coronary Artery Anomalies. In: Operative Cardiac Surgery, 5th Edition. Gardner TJ and Spray TL (eds). London: Arnold Publishers, 2004, 879-892. Gaynor JW. Reconstructive surgery: The Fontan operation and modifications. In: The Hypoplastic Left Heart Syndrome. Wernovsky G and Rychik J (eds). Kluwer Academic Publishing, 2003, 149-166. Gaynor JW. Aortopulmonary Window and Aortic Origin of a Pulmonary Artery. In: Pediatric Cardiac Surgery, 3rd Edition. Mavroudis C and Backer CL (eds). Mosby, 2003, 353-360. Shah MJ, Rome JJ, Rychik J, Gaynor JW, and Spray TL. Outcome of primary repair of tetralogy of Fallot in the newborn period. In: Proceedings of the Second World Congress of Pediatric Cardiology and Cardiac Surgery. Imai Y and Momma K (eds). New York: Futura Publishing Company, 1998, 446. Gaynor JW. Modified ultrafiltration following cardiopulmonary bypass. In: Proceedings of the Second World Congress of Pediatric Cardiology and Cardiac Surgery. Imai Y and Momma K (eds). New York: Futura Publishing Company, 1998, 626. Gaynor JW. Coronary artery anomalies. Chap. 88 in: Mastery of Cardiothoracic Surgery. Kaiser LR, Kron IL, and Spray TL (eds). Boston: Lippincott-Raven, 1998, 880-893. Gaynor JW and Spray TL. Congenital heart disease and anomalies of the great vessels. Vol. 2, Part IX in: Pediatric Surgery, 5th Edition. O'Neill JA, Rowe MI, Grosfeld JL, Fonkalsrud EW, and Coran AG (eds). St. Louis: Mosby, 1998, 1835-1848. Gaynor JW and Spray TL. Heart and Lung Transplantation. Chap. 61 in: Pediatric Surgery and Urology: Long-Term Outcomes. Stringer MD, Oldham KT, Mouriquand PDE, and Howard ER (eds). London: W.B. Saunders, 1998, 765-776. Gaynor JW and Sabiston DC Jr. Patent ductus arteriosus, coarctation of the aorta, aortopulmonary window, and anomalies of the aortic arch. Chap. III in: Textbook of Surgery: The Biological Basis of Modern Surgical Practice, 15th Edition. Sabiston DC Jr (ed). Philadelphia: W.B. Saunders Company, 1996, 1961-1975. Gaynor JW, Kern FH, Greeley WJ, and Ungerleider RM. Management of cardiopulmonary bypass in infants and children: Deep hypothermia and total circulatory arrest. Vol. II, Chap. 60 in: Glenn’s Thoracic and Cardiovascular Surgery, 6th Edition. Baue AE, et al (eds). Stamford: Appleton and Lange, 1995, 1023-1034. Gaynor JW and Sabiston DC Jr. Patent ductus arteriosus, coarctation of the aorta, aortopulmonary window, and anomalies of the aortic arch. Vol. II, Chap. 33 in: Surgery of the Chest, 6th Edition. Sabiston DC Jr and Spencer FC (eds). Philadelphia: W.B. Saunders Company, 1995, 1275-1315. Ungerleider RM and Gaynor JW. Pulmonary atresia or stenosis with intact ventricular septum. Vol. II, Chap. 39 in: Surgery of the Chest, 6th Edition. Sabiston DC Jr and Spencer FC (eds). Philadelphia: W.B. Saunders Company, 1995, 1492-1508. Gaynor JW. Congenital cardiac disorders: Patent ductus arteriosus, coarctation of the aorta, interruption of the aortic arch, aortopulmonary window, anomalies of the aortic arch, pulmonary artery sling, atrial septal defects, and ventricular septal defects. Chap. 49, Sec. I in: Sabiston Essentials of Surgery, 2nd Edition. Sabiston DC Jr and Lyerly HK (eds). Philadelphia: W.B. Saunders Company, 1994, 666-675. Gaynor JW and Ungerleider RM. Aortopulmonary window. Chap. 19 in: Pediatric Cardiac Surgery, 2nd Edition. Mavroudis C and Backer CL (eds). Chicago: Mosby-Year Book, Inc., 1994, 247-252. Elbeery JR and Gaynor JW. Hemodynamic management. Chap. 2 in: The Handbook of Surgical Intensive Care: Practices of the Surgical Residents at the Duke University Medical Center, 3rd Edition. Lyerly HK and Gaynor JW (eds). Chicago: Mosby Year Book Medical Publishers, 1992, 17-61. Gaynor JW. Shock. Chap. 3 in: The Handbook of Surgical Intensive Care: Practices of the Surgical Residents at the Duke University Medical Center, 3rd Edition. Lyerly HK and Gaynor JW (eds). Chicago: Mosby Year Book Medical Publishers, 1992, 62-79. Gaynor JW. Congestive Heart Failure. Chap. 5, Sec. III-B in: The Handbook of Surgical Intensive Care: Practices of the Surgical Residents at the Duke University Medical Center, 3rd Edition. Lyerly HK and Gaynor JW (eds). Chicago: Mosby Year Book Medical Publishers, 1992, 134-137. Gaynor JW. Patent ductus arteriosus, coarctation of the aorta, and anomalies of the aortic arch. Chap. IV in: Textbook of Surgery, Pocket Companion. Sabiston DC Jr and Lyerly HK (eds). Philadelphia: W.B. Saunders Company, 1992, 856-864. Gaynor JW and Sabiston DC Jr. Patent ductus arteriosus, coarctation of the aorta, aortopulmonary window, and anomalies of the aortic arch. Chap. IV in: Textbook of Surgery: The Biological Basis of Modern Surgical Practice, 14th Edition. Sabiston DC Jr (ed). Philadelphia: W.B. Saunders Company, 1991, 1855-1872. Gaynor JW and Sabiston DC Jr. Patent ductus arteriosus, coarctation of the aorta, aortopulmonary window, and anomalies of the aortic arch. Vol. II, Chap. II in: Surgery of the Chest, 5th Edition. Sabiston DC Jr and Spencer FC (eds). Philadelphia: W.B. Saunders Company, 1990, 1128-1172. Gaynor JW. Cardiac Monitoring. Chap. 20 in: The Handbook of Surgical Intensive Care: Practices of the Surgery Residents at the Duke University Medical Center, 2nd Edition. Lyerly HK (ed). Chicago: Year Book Medical Publishers, 1989, 531-560. Rankin JS, Elbeery JR, Lucke JC, Gaynor JW, Harpole DH, Feneley MP, Nikolic S, and Glower DD. On the law of the heart and related topics. In: Critical Care: State of the Art, Volume 10. Fullerton, CA: Society of Critical Care Medicine, 1989. Rankin JS, Elbeery JR, Lucke JC, Gaynor JW, Harpole DH, Feneley MP, Nikolic S, Maier GS, Tyson GS, Olsen CO, and Glower DD. An energetic analysis of myocardial performance. Chap. C, Sect. III in: Cardiac Mechanics and Function in the Normal and Diseased Heart. Hori M, Suga H, Baan J, Yellin EL (eds). Tokyo: Springer Verlag, 1989, 165-188. Gaynor JW and Sabiston DC Jr. Patent ductus arteriosus, coarctation of the aorta, aortopulmonary window, and anomalies of the aortic arch. Chap. 47, Sect. II in: Essentials of Surgery. Sabiston DC Jr (ed). Philadelphia: W.B. Saunders Company, 1987, 1061-1076. Rankin JS, Gaynor JW, Feneley MP, Glower DD, Spratt JA, Tyson GS, Maier GW, Olsen CO, Skelton TW, and Bashore TM. Diastolic myocardial mechanics and the regulation of cardiac performance. In: Diastole. Grossman W and Lorell B, (eds). Massachusetts: Martinus Nijhoff Publishers, 1987. Gaynor JW. General Principles of Surgical Management. Cardiopulmonary Bypass/Ultrafiltration. Presented at the Annual Update on Pediatric Cardiovascular Disease: February 20, 2002; Orlando, Florida. Gaynor JW. Ventricular Septal Defects: Surgical Management and Results. Presented at the Annual Update on Pediatric Cardiovascular Disease: February 20, 2002; Orlando, Florida. Gaynor JW. Tetralogy of Fallot: Surgical Management and Results. Presented at the Annual Update on Pediatric Cardiovascular Disease: February 20, 2002; Orlando, Florida. Gaynor JW. Coarctation of the Aorta: Surgical Management and Results. Presented at the Annual Update on Pediatric Cardiovascular Disease: February 20, 2002; Orlando, Florida. Gaynor JW. The AV Valve in the (Functionally) Single Ventricle. Presented at the Second International Symposium on Pediatric Echocardiography: February 2, 2002; St. Petersburg, Florida. Gaynor JW. The Tricuspid Valve in VSD Surgery. Presented at the Second International Symposium on Pediatric Echocardiography: January 31, 2002; St. Petersburg, Florida. Gaynor JW Mechanical Circulatory Support in Children. Presented at the Second International Conference on Mechanical Circulatory Support: December 1, 2001; Berlin, Germany. Gaynor JW Pediatric Cardiac Disease. Presented at Department of Surgery Lecture, Thomas Jefferson University Hospital: October 18, 2001; Philadelphia, Pennsylvania. Gaynor JW The Genetic Predisposition for Central Nervous System Dysfunction in Children with Congenital Heart Defects. Presented at Update on Pediatric Cardiovascular Disease:February 16, 2001; Orlando, Florida. Gaynor JW TAPVR: Surgical Strategies for Single Ventricle. Presented at Update on Pediatric Cardiovascular Disease: February 16, 2001; Orlando, Florida. Gaynor JW Pediatric Cardiothoracic Surgery Databases: Current State of the Art. Presented at Update on Pediatric Cardiovascular Disease: February 16, 2001; Orlando, Florida. Gaynor JW Ultrafiltration: What's Old, What's New? Presented at Update on Pediatric Cardiovascular Disease: February 16, 2001; Orlando, Florida. Gaynor JW 22q 11.2 Deletions: Outcomes of Cardiothoracic Surgery. Presented at the 22q 11.2 Deletion Second International Conference: June 23, 2000; Philadelphia, Pennsylvania. Gaynor JW Current Outcome after the Fontan Procedure. Presented at the Texas Children's Hospital: June 9, 2000; Houston, Texas. Gaynor JW The Patient with a Single Ventricle and Obstructed Pulmonary Venous Return is Inoperable: Pro. Presented at the Third World Congress of Pediatric Cardiology and Cardiac Surgery: May 31, 2001; Toronto, Canada. Gaynor JW Genetic Predisposition for CNS Dysfunction in Children with Congenital Heart Defects. Presented at the American Heart Association Scientific Sessions 2000: November 1, 2000; New Orleans, Louisiana. Gaynor JW Management of Patent Ductus Arteriosus. Presented at Neonatology Grand Rounds, Abington Hospital: December 1, 2000; Abington, Pennsylvania. Gaynor JW Current Outcome after the Fontan Procedure. Presented at Texas Children's Hospital :June 9, 2000; Houston, Texas. Gaynor, JW 22q 11.2 Deletions: Outcomes of Cardiothoracic Surgery Presented at the 22q 11.2 Deletion Second International Conference: June 23, 2000; Philadelphia, Pennsylvania. Gaynor, JW Genetic Predisposition for CNS Dysfunction in Children with Congenital Heart Defects. Presented at the American Heart Association Scientific Sessions: November 12, 2000; New Orleans, Louisiana.